A cuddle of a picture book for small people, especially if a new arrival is imminent. 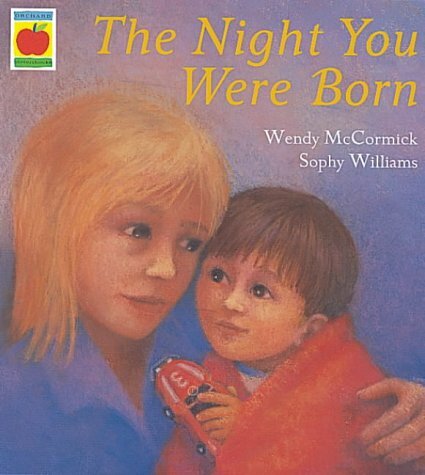 McCormick wrote the book 'to share the excitement and joy' of the nights when her twin sister's daughters were born, and there is indeed a sense of being invited into someone else's family, bringing with it a kind of sixties intimacy and optimism. As Jamie waits for news of the birth of his sister, his Aunt Isobel tells him about the night she waited for news of his birth - and the joy with which she and his uncle greeted the good news as they sang a welcome to him on a lonely seashore. The words - lyrical and poetic rather than the language of every day - are complemented by illustrations which themselves have a soft-focused warmth, somehow embracing the scenes, much as Jamie and his aunt snuggle together over the story, which of course ends in delight.